Many of you may not know it, but this year we celebrate the 40th anniversary of Chadic Newsletter. 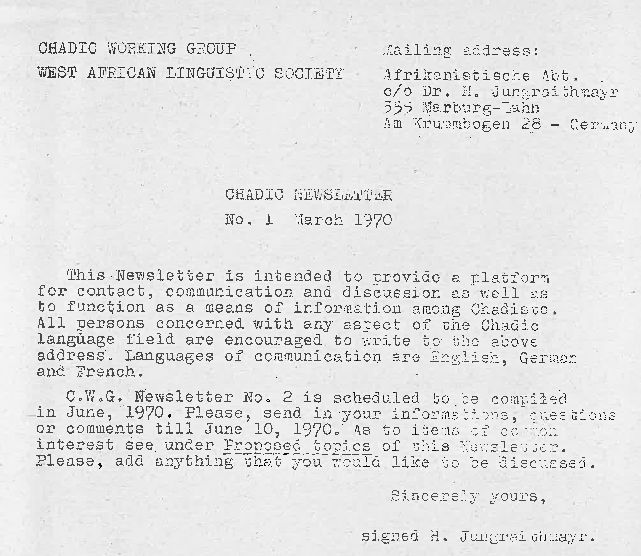 The first issue, an extremely simple mimeographed leaflet, appeared in March 1970, soon after the West African Linguistic Society meeting held in Abidjan where a newly founded Chadic Working Group entrusted Herrmann Jungraithmayr with the task of creating and editing a newsletter dedicated to research in the field of Chadic languages and linguistics. We won’t mind reading your birthday greetings and wishes :-). Drop us a note, or even better: Send one to Herrmann Jungraithmayr (his email address), who started it all 40 years ago.